We got separated from our buddy boat as multiple boats vying for positions going into the locks. 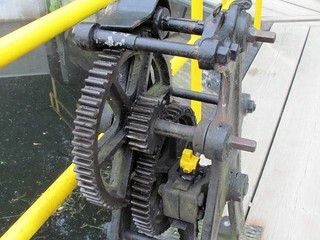 We did the big lock then pulled over to take pictures as Southern Cross approached. 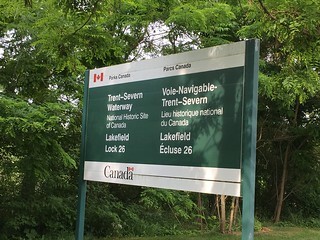 As the locks get so routine, I found a photo of each sign would help us place where we were that day! 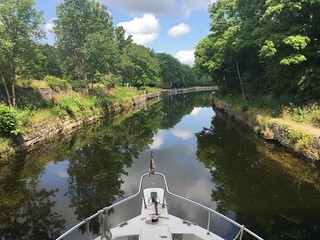 By the end of the day, we still had not got together, with the lock walls filling up, SC stopped at a wall that was open, and we were at the next wall a few miles further up. 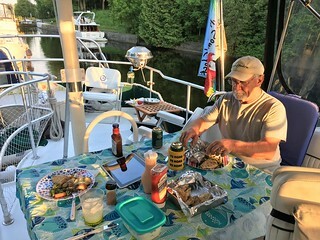 After a hard day, its nice to have a quiet meal on the upper deck of our boat! 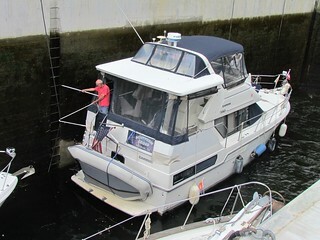 The lock walls are filling up early, we called ahead and the next two walls for full, so decided to stop . 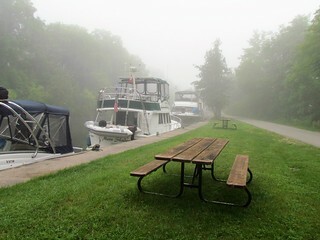 We woke to fog and hoped it wouldn’t delay our friends from catching up! Next morning SC came through about 10 am, we got good photos, then shoved off and continued together toward the next locks. Stopped early again to make sure we had a spot on the wall. 90 cents a foot, no electric or water. We shared the wall with campers! 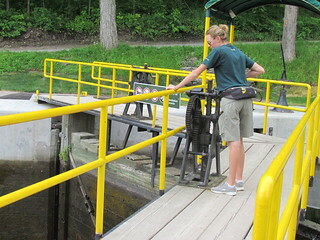 The lock operator monitors the speed of water flow on each gate. 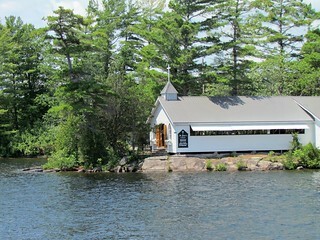 Along the way, we passed a church on an island! 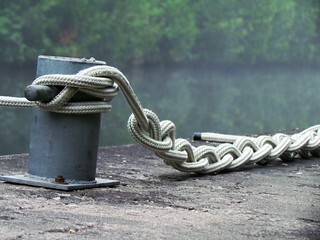 Only accessible by boat. This equipment gets a work out every day! 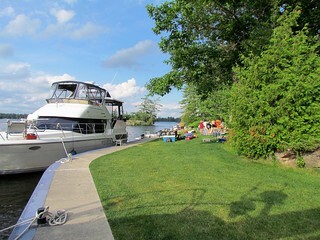 This entry was posted in Moon Shadow Log and tagged Boating, Canada Boating, looping, travel, Trent Severn. Bookmark the permalink.